Nils William received the Swedish Victor Örnberg Award in 1994. Nils William Olsson died 20 March 2007 at the age of 97. He had been in failing health for several years, mostly from the effects of Parkinson’s disease, and had lived with severe scoliosis for a number of years. Since 1998 he had lived with his wife Dagmar at the Mayflower Retirement Center in Winter Park, Florida. Despite his health problems, he and his wife had been able to live more or less independently until just before his death. Olsson will be missed mostly by his immediate family: his wife Dagmar, daughter Karna Barbro Olsson and her husband Philip Brown of Belfast, Maine, twin sons Nils Greger (Greg) and his wife Carolyn Olsson of Austin, Texas, and Pehr Christopher (Chris) and his wife Deborah Bergman of Stockton Springs, Maine. In addition, Olsson is survived by four grandchildren: David Anders Carlson and his wife Sarah (Findley) Carlson of Belfast, Maine, Lars Gavert Carlson and his wife Julia Carlson of Hilo, Hawaii, Jonas Erik Carlson and his wife Michelle Lutz of San Francisco, California, and Lily Marlain Olsson of Austin, Texas. There are also three great-grandchildren. Olsson was the oldest of four children born to Swedish immigrants Nils Albin and Mathilda (Lejkell) Olsson. All four children were born in the Seattle area but after their mother’s untimely death in 1913, when Nils William was only four years old, the family returned to Sweden until 1922. In that year Olsson and his family re-immigrated to the United States, settling in Sharon, Pennsylvania. He was placed in kindergarten at age 13 because he only spoke Swedish, but by the end of his first school year he had advanced to the 6th grade. He graduated from high school in 1929 and began his college studies at North Park College (now North Park University) in Chicago. He finished his undergraduate degree in 1934 after attending both Northwestern University and the University of Minnesota. After several jobs in the Chicago area, he was hired as admissions counselor and instructor in Swedish at North Park in 1937 and later as assistant in Scandinavian at the University of Chicago in 1939, instructor in Swedish in 1945, and assistant professor in the Germanics Department in 1950. His budding academic career was interrupted by the December 7, 1941, attack at Pearl Harbor and only a few weeks after that event, he enlisted in the U.S. Navy and, after basic training, received a commission as lieutenant (j.g. ), later lt. commander, and was assigned to the U.S. Legation in Stockholm, Sweden, as assistant naval attaché from 1943-1945. After the war he returned to the University of Chicago and obtained his Ph.D. in 1949. In 1947 he took a leave of absence from academia to serve as executive secretary of the Swedish Pioneer Centennial, then being organized in Chicago to commemorate the 100th anniversary of the arrival of the first significant Swedish immigration in 1845. (The celebration was delayed until 1948 because of WWII.) In 1949 he received a post-doctoral grant for additional research in Sweden, taking his wife and children with him. He had married the former Dagmar Theodora Gavert on June 15, 1940, and they had daughter Karna in 1942 and twin sons Greg and Chris in 1947. Returning to the United States, Olsson joined the United States Information Agency in 1950. He moved with his family to Reykjavik, Iceland, to serve as 2nd secretary and cultural affairs officer at the American Legation there. Two years later he was posted to the American Embassy in Stockholm, Sweden, where, now as a Foreign Service Officer, he served more than four years as Attaché and Public Affairs Officer, later 1st secretary and consul. In 1957 he was assigned to the State Department in Washington, D.C., and served in various capacities until 1962. In that year he began his last overseas assignment as 1st secretary and counselor for political affairs at the American Embassy in Oslo, Norway. In 1966 he was again stateside, serving in his last State Department assignment as diplomat in residence at Indiana University in Bloomington, Indiana, retiring a year later. In 1967 he was appointed executive director of the American Swedish Institute in Minneapolis, Minnesota, a position he held for six years. In 1973 he helped organize the new Swedish Council of America, and served as its first executive secretary from 1973 until 1984. His interest in Sweden and Scandinavia was prominent throughout his life. His doctoral dissertation at the University of Chicago was on an Icelandic saga. He was a founder of the Swedish Pioneer Historical Society (now the Swedish-American Historical Society) in Chicago in 1950, an outgrowth of the Swedish Pioneer Centennial. Probably his most outstanding accomplishment was his more than twenty years of research on Swedish immigration which resulted in his magnum opus, Swedish Passenger Arrivals in New York, 1820-1850, published by the Royal Library in Stockholm, Sweden, in 1967, and Swedish Passenger Arrivals in the United States (except New York), 1820-1850, written with the late Erik Wikén, published in 1979. In addition, Olsson wrote numerous articles, monographs, and other academic papers, dealing mostly with Swedish immigration, personal history, and genealogy. His proudest achievement was probably his launching in 1981 of a new quarterly magazine Swedish American Genealogist which is still being published by Augustana College, Rock Island, IL. He continued to edit SAG until he retired in 1997. 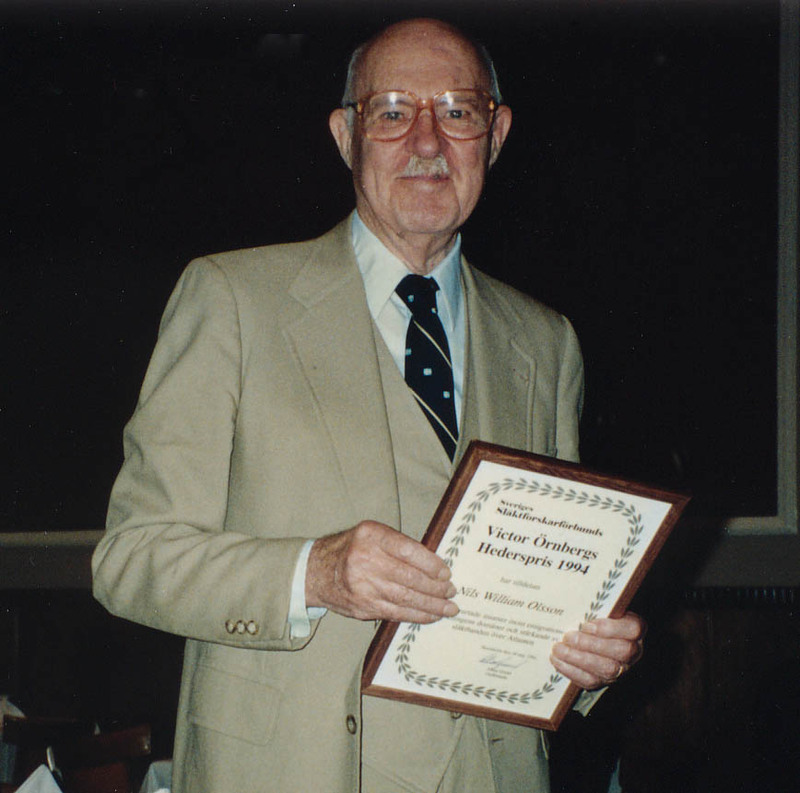 Olsson received numerous honors and awards throughout his life. Noteworthy were two awards received in 1968 and 1969. In 1968 he was granted an honorary doctoral degree from Uppsala University in Uppsala, Sweden, and in 1969 he was named “Swedish-American of the Year” by the Northern and Southern Divisions of the Vasa Order of America in Sweden. Nils William and Dagmar Olsson moved to Winter Park, Florida, in 1981 and continued to live independently until 1999 when they moved into a retirement village in Winter Park called The Mayflower. They had their own apartment until late 2006, when health concerns and other afflictions made a move to the nursing care section of the Mayflower necessary for both of them. 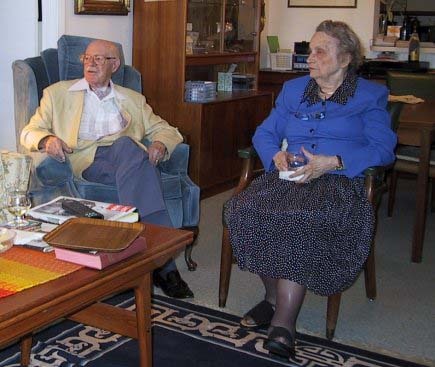 Nils William is survived by his wife, Dagmar Gavert Olsson, his wife of nearly 67 years. Nils William and Dagmar in their home in Winter Park. April 2000. This obituary was previously published in Swedish American Genealogist 1/2007.